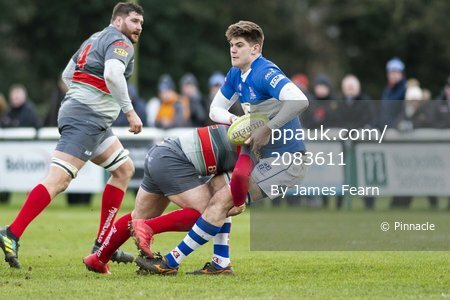 Bishop's Stortford V Plymouth Albion, Hertfordshire, UK - 9 Feb 2019. Caption: James Apperley of Bishop's Stortford is tackled by Cam Setter of Plymouth Albion during the RFU National Division One match between Bishop's Stortford and Plymouth Albion at Silver Leys, Bishop's Stortford, Hertfordshire on the 9th February 2019. [Photo: James Fearn/PPAUK]. Premier League, Football League and Conference Football images are subject to Licensing agreements with Football DataCo. Pinnacle Photo Agency Ltd makes no guarantees, representations or warranties regarding names, trademarks or logos appearing in images.